- General Resource Limited and Neucom Incorporated make their first appearance. The United Government and United Galaxy, which were formed years later, were under their silent control for more than a 1,000 years. A third entry from the widely popular flight shooting game, Ace Combat. Unlike the space-themed settings found in other games on the UGSF timeline, this title holds a truer vision of current world themes. The year is 2040, where the player takes on the role of a jet fighter pilot to engage in fierce dogfights. The exhilarating aerial battles is made possible by the level of technology and quality graphics, which brought many praises and accolades to the title. Focus was also placed onto the storyline, with detailed world settings coupled with special animations. The title is labeled as a masterpiece, even among its series. - Battle events showcasing multi-legged tanks, also known as “VEHICLE ,” appears. A competitive 3D shooter where you ride a futuristic tank called a “VEHICLE,” seeking to win bounties within the game. The game is set in a distant future where you engage in 1 vs 1 battles. The game received praise for its simple game system and futuristic single person view CG use within the game. Players facing each other on the arcade cabinet showcased their control skills using the dual stick controls. The strategic and skill-based nature of the game and competitive design added depth to the battles. The game garnered many fans, and to no surprise, became a hit with its port to the PlayStation system. - Governments from each nation come together to find a solution to the population boom on Earth. This leads to establishment of the United Government. - Within the same year, an order was placed to G.A.L.O.F. Corporation to build the Type-3 space island colony, “Uranus.” Meanwhile, in an attempt to establish order under the United Government, the allied nation’s military forces were dismantled and reorganized to create 4 prominent military forces under the United Government – the UGA (United Government Army), UGAF (United Government Air Force), UGN (United Government Navy), and UGSF (United Government Space Force). 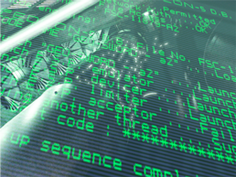 From its establishment, the UGSF becomes the primary receptacle of technology, which leads to the creation of the UGSF Special Attack Team, Cyber Commando. - The University of GAIA is established 10 years later in 2100. - Within the same year, rebels take arm to occupy “Uranus.” With the looming threat of the colony being directed for impact, the UGSF deploys the UGSF Special Attack Team, Cyber Commando, to stop the rebel revolt. - Within a year, “Uranus” was liberated from the rebels, and later abandoned. A competitive 3D shooter sequel to the popular game title, Cyber Sled. Staged in a futuristic metropolis, the player controls a tank called a “VEHICLE” to stop the A.I. computer which took over a space colony. The game builds upon the well-received competitive features from the previous title, and pushed the package on graphical quality with its use of realistic 3D graphics. The single player mode also saw improvements, with greater varieties seen within the story, maps, enemy tanks, among others. - The Photon Drive, a propulsion engine in development since 2050, enters its release stage. It brought about a new age, the First Space Pioneer Era, where many interstellar spaceships were deployed to conduct research on star systems as far as 10 lightyears away. Spaceships traveled to the Alpha Centauri system (Toliman and Proxima), Epsilon Eridani system (Ozma), and the 61 Cygni system (Exia), where they discover planets capable of sustaining life (such as Corneus) or with terraforming attributes (such as Exia 2). - In commemoration of these discoveries, the A.G. (After Galactic) epoch is born. This designation becomes common in use from 2100, next to the pre-existing A.D. epoch. - Hiromi Tengenji enters takes on the final exam to graduate from the University of GAIA’s cosmonautics, “Top of the Space” course. 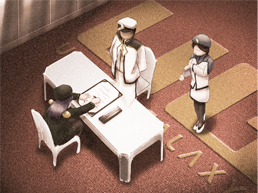 After her graduation, she joins the UGSF. A 3D shooter staged on land and in space. The story begins with the player playing as a female student, Hiromi, who is attending college on Earth and going through an exam which pits her against enemies in battle. Hiromi navigates 2 vehicles called the AIRBIKE and AIRPLANE through a number of stages, defeating enemies by shooting them or by using bombs, while collecting items to power-up her vehicle. Aside from the game’s unique setting, it was also praised for its chic music and pop graphics. - The first space-time jump drive, “Warp Drive,” is developed and enters its release stage. With it, humankind expanded their frontiers to the far reaches of the galaxy, paving way to the Second Space Pioneer Era. The term “Earthian” and “Galaxian” is born. - Within the same year, the United Government is dissolved and reorganized to form the United Galaxy. As with the United Government, the United Galaxy based its operations on Earth. - The very first contact with an extraterrestrial being was made in the Epsilon Eridani system. This “being” is later referred to as a “Live-Weapon,” or more commonly known as the “UIMS” (Unknown Intellectual Mechanized Species). - Within the year, the Cannon Seed on the planet Dogmas was destroyed, along with the Dogmas, leading to the retreat of the UIMS. A 3DCG shooter attraction that was displayed at The International Garden and Greenery Exposition held in Osaka Japan in 1990. This became Namco’s first theme park attraction, and was a hot topic among many gaming fans. The attraction featured a large, circumferential screen, where up to 28 players could play together. It displayed the latest in 3DCG technology along with fixtures that moved with the game, providing a level of immersion never experienced before. The attraction surprised and impressed people with how it provided entertainment beyond expectations, making the attraction a topic of discussion even to this day. - A new type of UIMS, the UIMSΔ, invades the planet Corneus. - Within the year, the UIMSΔ space fortress, “GOURB,” and Corneus is destroyed, with the UIMSΔ taking flight in defeat. A 3DCG shooter port of the theme park attraction, Galaxian 3. Not only does the title feature the scenario from Galaxian 3 - Theater 6 and Project Dragoon, it also had an original scenario, Rising of GOURB. You could also play with up to 4 people, and with how the game featured a game recorder, a gunner mode, and more, players could get the most out of the world of Galaxian 3 that this game had to offer. 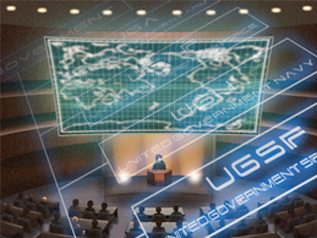 - In order to face the extraterrestrial threat, the UGSF initiates “Project D.” Various technologies obtained from the UIMS and UIMSΔ are evaluated and adopted into the UGSF. This made it possible for the UGSF to reduce the size, and increase the performance and firepower of the UGSF spacefighters. The technological application adopted became a long running standard used among future spacefighters. - The technology acquired from the UIMS made it possible for the United Galaxy to conduct large scale immigration across the galaxy, bringing about planetary modifications. As a result, 60 star systems came under United Galaxy order, with a total of over 40 billion in population residing within those star systems. - The United Galaxy comes in contact with aliens (the ETI or Extra-Terrestrial Intelligence) triggering the Galaxian-Galaga War of 2279. The small size and sheer number of the aliens made it impossible for the UGSF to employ their larger vessels of war. So instead, the UGSF deploys their proto-type spacefighter, “Galaxip.” This move led to the defeat of the aliens, and since then, this approach becomes a standard measure employed by the UGSF for their operations. - In just 3 years from the Galaxian-Galaga War of 2279, the Galaxian-Galaga War of 2281 begins. 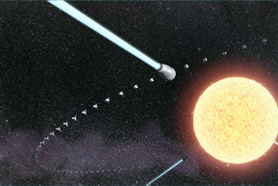 To face the aliens (codenamed “Galaga”), the UGSF prepares a defensive line to protect the solar system. 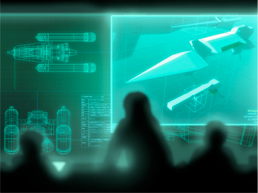 Early preparations against alien attacks made it possible for the UGSF to finish development of a new spacefighter, “Fighter.” The Fighter is equipped with Dual Fighter Mode technology to face the impending threat in place of the now defunct, Galaxip. - Following Galaga, a new extraterrestrial lifeform, the ETI-2 (Next Extra-Terrestrial Intelligence), is discovered. These lifeforms created bases within the United Galaxy star systems, and quickly began occupation of their surrounding territories. In accordance to negotiation protocols, the United Galaxy tried to initiate friendly contact with these lifeforms, followed by a warning, and finally intimidation, to all being replied with force. The UGSF completes their analysis of the enemy force, and codenames them “Bosconian.” With the analysis complete, the UGSF moves to deploy their means in facing the Bosconians, the “Blaster” spacefighter. 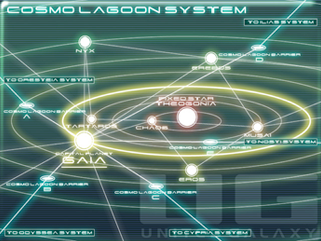 - Within the same year, the Bosconians abandons and retreats from their bases within the UGSF star systems. These abandoned bases are claimed by the UGSF, and through research of these facilities, the UGSF gains further information regarding the Bosconians. Not making waste of these bases, the UGSF incorporates them for their use. A space shooter that challenged players to go on a mission in space to find and destroy enemy bases. Using the game radar, the player controls a spacefighter which could move in 8 directions, so as to find and attack enemy bases with its missiles. The realistic enemy base graphics, condition indicator, synthesized audio announcements, and more, brought about a sci-fi ambiance to the game. The game also garnered attention with the poster art which was designed by the popular illustrator, Shusei Nagaoka. - After experiencing the Galaxian-Galaga War of 2279 and the Galaxian-Galaga War of 2281, the Galaga forces quickly evolve into a higher intelligent form - a third generation of aliens called the “Gaplus.” The Gaplus proceeds to create a new empire under their rule. 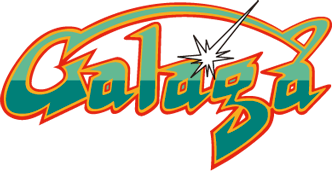 The UGSF, fearing the rise of the alien force, develops a new spacefighter, the “Ogre Header,” which is designed to utilize powerful weapons collectively called “Blaster Heads.” Recognizing this threat, the Gaplus steals the Blaster Heads, which marked the beginning of the Galaxian-Galaga War of 2283. - The UGSF thwarts the threat of the Galaxian-Galaga War of 2283, but the aliens have evolved to a point where they can use “Hyper Drive,” a dimension jumper. After building their base of operations, the aliens begin their assault on Earth using Hyper Drive. In response, the UGSF takes defensive action to protect Earth from the spawning aliens. After successfully defending Earth from the aliens, the UGSF discovers that the surviving aliens have retreated through a dimensional hole. With this discovery, the UGSF creates a plan to defeat the aliens and to destroy the alien’s base of operations, “Planet Galaga.” Assigned to the mission was the spacefighter, “Blast Fighter,” equipped with Triple Fighter Mode technology. - Within the same year, Planet Galaga falls to the UGSF, and from its remains, the UGSF discovers the technology behind Hyper Drive. - The second wave of Bosconian attacks commence. This time, the Bosconians weren’t the only threat. Looming behind the Bosconian attacks were the “Battura,” who would appear hundreds of years later to lay siege against humankind. Sensing that there is something peculiar with the Bosconians, the UGSF deploys their latest spacefighter, the “Blaster FR.” With its deployment, “Operation: Blast Off” commenced. 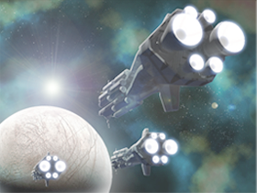 A popular space shooter positioned as a sequel to Bosconian. 8 years have passed since the previous game, with the game design evolved into a vertical scrolling shooter, and yet, players can feel the charm of Bosconian with how the game incorporates the enemies, stages, and story settings from the previous game. The game stage challenged player survival deep in enemy bases, facing brutal Bosconian bosses. The player can change the spacefighter formation to access 4 different types of shooting, allowing for strategic selection to match the game play situation. - The Galaxian-Bosconian War of 2290 begins, and spreads its threat to Earth. Noting the gravity of the threat, the UGSF activates “Operation: Final Blaster.” They deploy their newest spacefighter, the “Blaster Mk2 Phoenix,” that was developed to face the Bosconians. - Within the same year, the enemy’s planetary frontline, “Planet Bosconian,” falls under the UGSF’s attack, leading to the retreat of the Bosconians. - During the alien and Bosconian wars, the United Galaxy begins restoration of their battle-ridden planets. General Resource Limited establishes an intergalactic band of mercenaries called the “Bounty Hounds” to rid of any remaining alien threats. 8 planets under the United Galaxy's star system are set with an interstellar computer cluster system called the “FEDCOM,” which were put to use. 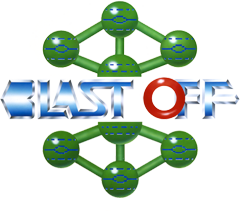 An action shooter that plays homage to the space shooters, Bosconian and Blast Off. The easy to understand power-ups and 4-speed shifts on the spacefighter offered a well-balanced challenge to newcomers, and depth to veterans of shooters. 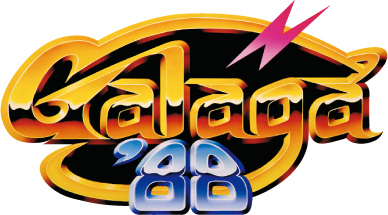 This home console game not only featured characters from Bosconian, but also unique characters from uber-popular shooter, Xevious, with the Bacura and geoglyphs, bringing a smile to fans of previous shooters. - During the Second Space Pioneer Era, continued attacks by extraterrestrial lifeforms left many planets in ruin. A mercenary assigned to the Bounty Hounds is dragged into the conspiracies between two mega-corporations, “General Resource Limited” and “Neucom Incorporated,” who have been in conflict before the age of space pioneering. An original action game title that was released on the PlayStation Portable. The player plays as a member of the mercenary group, "Bounty Hounds," to face the ETI (Extra-Terrestrial Intelligence) using a variety of weapons. The exciting battle action scenes provided players with a sense of exhilaration through use of over 500 weapons and armor to defeat swarms of enemies. The game also used PlayStation Portable features for wireless battles and game sharing. - Within the same year, they defeat and liberate Exia from the Zolgears. - 5 years later, the Bussard-Ramjet Drive Dragoons were retired from action. A 3DCG shooter featuring multiplayer co-op play. The game featured an original scenario, Attack of the Zolgear. With the concept of allowing set-up in arcades, the original theme park attraction, Galaxian 3, was scaled down in size and named Galaxian 3 – Theater 6. But, despite the game being scaled to fit arcades, it was still very large with its large screen projector that allowed up to 6 player co-op gameplay. With how players could now play a Galaxian 3 game outside of theme parks, the game became a beacon to bring more fans in to the series. A 3DCG shooter that was designed as a single player game set within the world of Galaxian 3. The player plays as a member of the spacefighter, GeoSword, waging epic space warfare using powerful lasers to defeat oncoming enemies. The game challenged players to infiltrate enemy lines to get into the planetary threat, Red Eye, to destroy its core. This theme, along with the graphics and sound effects, brought a level of immersion unlike any before. 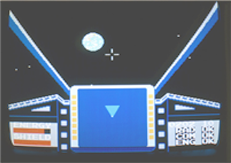 The arcade cabinet also incorporated a special lens which gave a wider scope of vision, bringing about an environment that made it feel as if the player was sitting in the spacefighter’s cockpit. - Attacks from extraterrestrial lifeforms cease, and an era of stability is ushered in to the United Galaxy. Incidents of note only occur within the United Galaxy's star systems. - Among the star systems under the United Galaxy’s rule, a planet is invaded by monsters appearing from underground. To help defend the planet, Taizo Hori comes to the rescue. A strategic, digging game where the player controlled Dig Dug to defeat the cute enemy characters, Pooka, designed as if they were wearing swimming goggles, and Fygar, designed to breathe fire as a form of attack. To defeat them, the player used a pump to pump the enemies to make them explode – a method of attack which was never seen before. These unique designs caught many people’s attention, and the game went on to become a popular hit among male and female gamers alike. The game featured various digging techniques, such as one where players could squash multiple enemies by digging under a rock to drop on them. - Among the star systems under the United Galaxy’s rule, an island on a planet is invaded by monsters. Taizo Hori, the hero who saved the day in the previous Dig Dug incident, comes to the rescue again. An action game sequel to the popular game, Dig Dug. The player still controls the Dig Dug character, but this time, the stage moves from digging underground to a small island on the open sea. The iconic Pookas and Fygars are at it again, causing a commotion that Dig Dug must face. The most notable difference from the previous game is that, not only does Dig Dug use a pump, but also a jackhammer to create cracks into the ground as a means of attack. The game also introduces a new and epic attack which added a new layer of strategy to the game – sinking the enemies along with pieces of the island. - A distress call is received from the outskirts of the United Galaxy’s star system. The call for help is sent from a group of peaceful extraterrestrial lifeforms called the “Paccetian.” The vicious “Octians” built an underground fortress, the “Baraduke,” where the Paccetians are held captive. To answer the call of distress, the UGSF sends in Masuyo Tobi from the UGSF Space Cavalry to save the Paccetians, and to defeat the Octians and Baraduke. An action shooter where the player must rescue the alien race, Paccetians, from the underground fortress, Baraduke. The player uses an 8-way joystick to move the character, and press the fire button to fire their equipped wave guns. The eerie Octians stand in the player’s way as you go deeper into the fortress to face the final boss, the Octian King, where players were challenged to show the skills they have amassed through the game. Unlike any previous Namco titles, the game featured a dark theme that surprised many players used to Namco’s style of games. In this way, the game became a pioneer to a new line of action games. - 3 years have passed since the Baraduke incident, but peace did not last long as the Octians has risen once again. With their second coming, the UGSF officially deems the Octians from being “mere savages” to “threats” to other lifeforms. Masuyo Tobi is ordered to face the Octians again, this time to finish them for good. An action shooter sequel to Baraduke. The Octians are at it again, and this time, the player is equipped with new weapons and vehicles to help. The excitement of navigating the powerful vehicle, and seeing the eerie, but strangely cute Paccetians and Octians, brought about a very unique game setting. The somewhat confusing maps and control quirks were made anew to a simpler mechanic. Overall, the game became a unique experience with its comical and surreal design. An action game where the player controls the main character, Susumu Hori, digging through blocks to reach the goal. The player’s speed was put to the test by drilling down through colored blocks while avoiding the dangers of being smashed by falling blocks. The cute character, easy to understand rules, and puzzle elements added a layer of depth to the game play, and made this game series widely popular among a vast range of gamers. What began as an arcade cabinet soon was ported to the home console and handhelds, thus proving the popularity of the game. - Wataru Hoshi of the UGSF Astro-Rescue Team and Chuta Bigbang tries to solve the spaceship crashes that were occurring on a planet in the United Galaxy's star system. An action game paying homage to the popular Mr. Driller game, where the player controls the main character, Wataru Hori, to save ally aliens stranded on drifting planets. The player times the jump to hop onto the drifting planets to form a triangle to save the aliens. The simple control using a single button and puzzle elements brought a unique touch to the game. The game appeared as an arcade game, then later was ported to the iPhone and iPad. 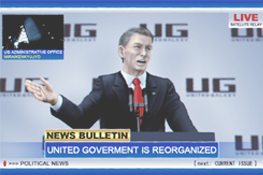 - The UGSF identifies a third new threat - the Battura. The relative peace the United Galaxy was enjoying delayed updates to their spacefighters. Using this to their advantage, the Battura takes control over many of the star systems under the United Galaxy. The UGSF tries to buy time to rush development of a new spacefighter equipped with the latest in technology. This brings about the spacefighter, “G.A.I.A.,” that is equipped with the latest in transport drive technology, the “Quasar Drive (black hole drive),” and a long distance jumping drive, the “Hyper Drive (quantum teleportation drive).” Upon its completion, “Operation: Star Luster” commenced. - Within the year, the Batturas are defeated, and their mobile vanguard fortress, “Dark Planet,” is destroyed. - After their retreat, the UGSF discovers from the Battura’s remains a technology that the UGSF could not achieve – the Diastasion reactor technology. Namco’s first Family Computer original, tactical 3D space shooter. The game featured a real time simulation element where the player goes on board the spacefighter, GAIA, to face enemy fleets amid the ever changing tides of battle. This unique style of game play made many question the accessibility of the game when it first released, but as time passed, players started to take note of its strategic design, and today, it is now considered a classic masterpiece. - With the United Galaxy weakened from Operation: Star Luster, a full scale attack is orchestrated by the extraterrestrial lifeforms. The UIMSΩ, Galaga, Battura, Bosconian, and a new extraterrestrial lifeform, “Sadeen,” begins their invasion. With this unprecedented crisis falling upon humankind, the UGSF initiates “Operation: Star Ixiom,” where spacefighters from the past and present are brought together to face impending threat. - With the success of “Operation: Star Ixiom,” the mobile planet controlled by each extraterrestrial threat were destroyed, but the threats themselves dispersed from the frontlines of battle and began their infiltration into the many star systems under the United Galaxy. Furthermore, a third of the United Galaxy's star systems were either lost or destroyed from the attacks. Worse still, Earth is infiltrated and soon falls to the UIMS. With the loss of Earth, the United Galaxy moves to a new planet to call their home. This planet is called “Gaia,” and is the fourth planet within the Cosmo-Lagoon system. 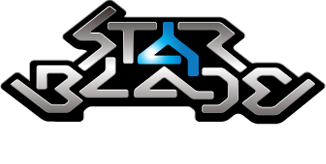 A 3D space shooter that inherits game designs from the highly-rated Family Computer game, Star Luster. The game features game original designs, such as a map mode where players prepared for the enemy space fleets, and a combat mode where the player is placed into the spacefighter’s cockpit to face enemies in direct combat. New spacefighters and weaponry were also introduced into the game, bringing deep, epic space battles to the table. A new feature to the game allowed players to choose iconic spacefighters from the UGSF world, such as the Galaxip and the GeoSword. - A clan of Bosconians weakened by Operation: Star Ixiom raises a nation called “Bosconia.” Soon after, the nation surrenders to the United Galaxy and becomes a part of the United Galaxy. - “Project D 2nd,” a program to strengthen the United Galaxy through the course of a 100 years, is put to operation. The United Galaxy establishes a new star system with Gaia as their capital planet. During this time, advancements were made in the field of Diastasion science. - After deliberations by the United Galaxy, “Operation: Dreadnought” is put into effect to remove the UIMS from the galaxy. A collection of mini-games themed around a school-faring robot, Mizuiro-chan, and her school days at Blood Academy. The game uses the Nintendo DS stylus to draw and write within the game. The cute and pop characters along with the chaotic world theme were factors bringing popularity to the game. An interesting masterpiece with a story that would bring a smirk, smile, and surprise to everyone playing, especially in relation to the surprising reveal towards the end of the game. - An official blog by Mizuiro Blood is released which gives insight on how “Operation: Dreadnought” was seen by the UIMS. 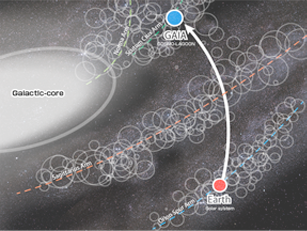 - Within the same year, over 1.04 million space vessels are sent to Earth to regain control. The operation succeeds, and Earth returns to the United Galaxy’s control. - Immediately after, an all-out attack is orchestrated against the UIMS, Galaga, Battura, Bosconian, and Sadeen forces within the United Galaxy’s star systems. An original story that was published on the official blog for the Nintendo DS game, Mizuiro Blood. The chaotic world of Mizuiro Blood have now spread onto the Internet! Among the chaos, a particular blog suddenly appears where an emergency announcement is made of the UGSF forces breaking through the Saturn defense line. Shocking truths are slowly revealed. Find out the surprising fate of Mizuiro-chan and her fun-loving characters. - The final era in warfare begins. The remnants of the UIMS converge to invade Earth. To counter their invasion, “Operation: Blue Plant” is initiated. A 3DCG shooter that was on display at the 2001 Amusement Show. The game was a large-scale amusement machine proto-type which featured contents to make it a sequel to the game, Starblade. The cabinet featured a half-sphere screen, O.R.B.S., which was still under development then. Using the latest in 3DCG technology and voice navigation, players were immersed in the ambiance of space as an actual spacefighter pilot within the game. To this day, people who had an opportunity to play the game still talk of how epic it was to see space appear on the machine’s giant screen. - An era of peace begins for the United Galaxy as they restart their plans to expand their influence across the star systems. During this time, the “S.T.A.R. Line,” an energy tube used for interstellar transfer of inorganic materials, enters its release stage. The S.T.A.R. 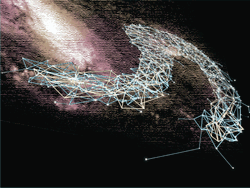 Line connects the star systems under the United Galaxy’s control, and brings about a revolution in transit technology and economy. - With the installation of the S.T.A.R. Line technology, the United Galaxy's star systems show explosive growth. By the end of 2700, territorial control expanded across 5,000 lightyears from the capital planet, Gaia. An RPG game where the player, summoned to the game world, becomes commander to a tank battalion to protect the unknown planet of Orius from the invading monsters. The player forms a battalion, trains its members, and strengthens the tanks to face the monsters that appear. The game features 30+ beautiful ladies with full voice acting to liven up the game. The player can freely pair the ladies to the tanks to create various attack formations. The game also introduces a Rotation Battle System where players can change the formation lines freely to bring victory against the powerful monsters. - Within the United Galaxy's star systems lies a nation of threat, codenamed “Military Empire.” The UGSF’s contact with the threat triggers the Avonford Conflict of 2845. With the conflict in motion, those involved are dragged deep into the mires of battle, leading to the war known as The New Space Order War, which continues on until 3210. A real-time strategy game staged in space that was developed to allow multiplayer game play features for use in game arcades. Each player would be leading a force to expand their territories in space, conducting warfare against enemy vessels and home planets. The game was put to test from 2004, and from early on was a focus of attention with how detailed the settings were and with its epic storyline. The game was tested from when the real-time strategy genre was still relatively unknown, but the game kept things easy to understand. Within the realm of arcade games, the design was a first of its kind, and became a title of inspiration to all. - The S.T.A.R. Line was only capable of transporting inorganic matter, but in 7650, advancements in technology brings about the “Hyper-Way,” an evolution to the S.T.A.R. Line which enables transport of organic matter. Meanwhile, battle ensued between the UGSF and aliens. With the aliens at an advantage, the UGSF develops the ultimate weapon, “V-28,” but the energy necessary to run the weapon, “Geltorium,” was under enemy control. It was then the UGSF pilot by the name of “Jimlitter” gained access to Geltorium. With fate on his hands, he navigates his Hyper-Way spacecraft, “Thunder Ceptor,” through enemy fields to deliver the precious resource to the UGSF headquarters. A 3D shooter where the player flies the spacefighter, Thunder Ceptor, to battle through enemy aliens to reach the UGSF base. The cabinet has a cockpit design where the player sits in, and a special joystick used to navigate the spacefighter to defeat and outmaneuver enemies and obstacles. Players could immerse themselves in the action with how they could use powerful blasters and napalms, while speeding through narrow spaces. 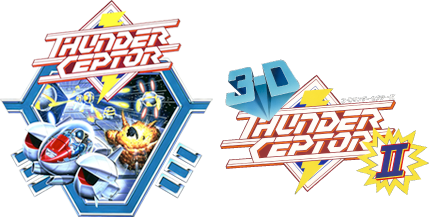 Later, 3D Thunder Ceptor II was released, garnering attention from many gamers. The sequel introduced a special scope that allows the player to enjoy the game in 3D.